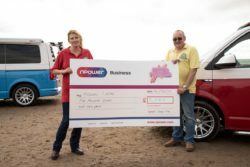 Moovans wins npower Superpowered Business Award! 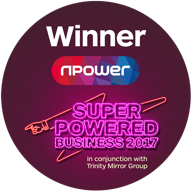 It all started with a phone call from npower telling us we had been chosen from hundreds of companies to win the Superpowered Business award. To say we were excited is not the half of it. As well as being presented with a cheque for five thousand pounds, we also won some much valued business support from Gary King a business growth expert. To win the award was amazing. We know our vans are great but for others to recognise what we are trying to build means a huge amount. The judging took place in August this year. Entries were judged after the closing date by a panel made up of Mirror Money editor Tricia Phillips, winner of BBC’s The Apprentice Tim Campbell, entrepreneur Matthew Roberts of Timber Neutral, business growth expert Gary King, and Richard Longbottom from npower Business. The judges were looking for companies that were Innovative and Engaging, offering something different for their customers. Our entry stood out head and shoulders above the rest. After the phone call where yours truly was absolutely gobsmacked, we were sworn to secrecy until the announcement in the press. This was actually the hardest bit because we wanted to shout from the rooftops. The marketing department at Npower arranged for a film crew to come down and interview me, the CEO. On a lovely August day we took the vans into a field at Moovans HQ and let the film crew see what the vans can do. After a Moo Brew and some nibbles from our exclusive welcome basket, we set to work. I could not believe how many takes we had to do. It certainly isn’t easy being a film star! I also learned that it is not a good idea to put lipstick on between takes as this causes continuity problems. 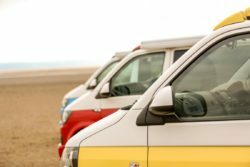 In the afternoon we took the vans down to the beach at Brean Sands where the stock shutter release video was shot. My husband demonstrated how easy it is to fold out the beds, raise the roof and convert the van into a luxury hotel on wheels. Kali, the Moo dog loved it too running around the sands with lots of vans to explore and film crew to pat her. It was a very long day with our film director making us do many takes to get the shots just right. All in all 8 hours filming for a 90 second film! You can watch the film of the awards on the Daily Mirror website. Check out the highlights from the day here. 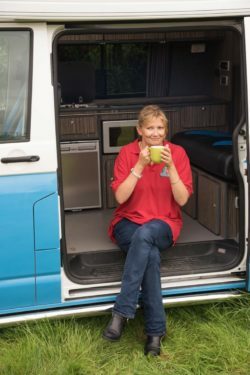 For us now it’s back to the day job of getting our vans ready for all our customers’ adventures. We had a great time and are really proud to have won. Thank you npower and the rest of the judges for choosing to recognise our business.